I traveled to Macau in mid December. I went around the World Heritage sites in Macau Peninsula in the first half and mega resorts in Cotai area in the latter half. In this article, I will write about MGM Cotai and Wynn Palace as part of Day 4. First, I visited MGM Cotai. “MGM Cotai (美獅美高梅)” is a casino resort opened in February 2018. It is run by “MGM Resorts International”, an American entertainment company. For the MGM group, MGM Cotai is the second casino resort in Macau following “MGM MACAU (澳門美高梅)” in Macau Peninsula (see the related article). Let’s go into the building. Decoration on the ceiling was fantastic. MGM Cotai had a large hall called “Spectacle (視博広場)” in the center. LED displays were set over the wall and projected image was played, so it was visually amusing. There was open ceiling space in the hall, which created liberating atmosphere. Now I will have meal. I visited “Janice Wong MGM”. A staff kindly brought some newspapers and magazines for me while I was waiting for the meal. It seemed projection mapping was played from 7 p.m at Ruins of St. Paul’s. I visited it on the second day evening (see the related article), but I left Ruins of St. Paul’s before 7 p.m., so I regretted it a little bit. I had a small waffle. I will walk around “Spectacle (視博広場)” again. Just like other casino resorts, MGM Cotai was equipped with a casino in the center. Talking of MGM, this lion mark was famous. View from the upper floor was good. Finally, I took a look at the hotel lobby. Following MGM Cotai, I visited Wynn Palace, which was located on the opposite side of a road. “Wynn Palace (永利皇宮)” is a casino resort opened in August 2016. It is run by “Wynn Resorts”, an American entertainment company. For the Wynn group,Wynn Palace is the second casino resort in Macau following “Wynn Macau (永利澳門)” in Macau Peninsula (see the related article). 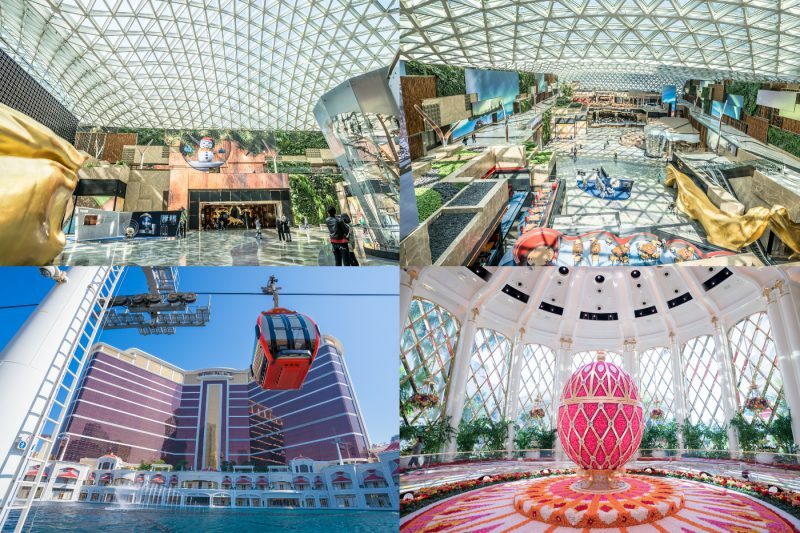 As a main attraction in Wynn Palace, there was “SkyCab”, a gondola. Visitors used it to go to the entrance. So, let’s take a gondola ride. Fortunately, there were not any other visitors at this time, so I was able to get it all to myself. Unfortunately, however, it was difficult to take photos around this time due to reflected glare. From the left, MGM Cotai, Sands Cotai Central and City of Dreams. I arrived at the entrance of the facility. There was a big pond in front of the facility and a fountain show “Performance Lake” was held regularly. In Wynn Palace, there were a lot of art works and I will look at them. I made a circuit and returned to the start point, so I left Wynn Palace. It was far from here to the next destination (Galaxy Macau), so I used “Cotai Connection”, a free shuttle bus that goes around casino resorts in Cotai area. FYI: there are two free shuttle bus routes – (1) Cotai Connection [Galaxy Macau – Venetian – Studio City – Sands Cotai Central – City of Dreams – Wynn Palace] and (2) Cotai Express [Galaxy Macau – Studio City – Venetian]. That’s it for the article about MGM Cotai and Wynn Palace as part of Day 4. Both MGM Cotai and Wynn Palace are relatively late comers in Cotai areas, and they are a little bit far from Cotai Strip, the main street in Cotai. So, setting repeaters side, I would not recommend these two casino resorts as accommodation, especially if you come to Macau for the first time. However, there is good news, which might change the situation. Light Rail Transit (LRT) is under construction and it is expected to open in 2019. “Cotai East” station (cireled in blue color) is located just near MGM Cotai and Wynn Palace. Once the LRT starts its operation, perhaps this area might replace Cotai Strip and become the central area in the future!? In the next article, I will write about Galaxy Macau as part of Day 4.